James J. Strang. "The Record of Rajah Manchou of Vorito." 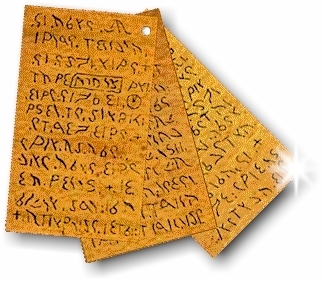 (Facsimile of the Brass Plates). Voree, Wisconsin Territory: 1845. 19.6 cm. x 10.6 cm. Broadside. Light wrinkling and spotting, but free of imperfections and otherwise in very good condition. Laid in a butterfly folder of acid free card stock, and placed in a clamshell storage box of 1/4 calf and marbled trays, labeled: "FAC-SIMILE OF BRASS PLATES STRANG VOREE 1845". 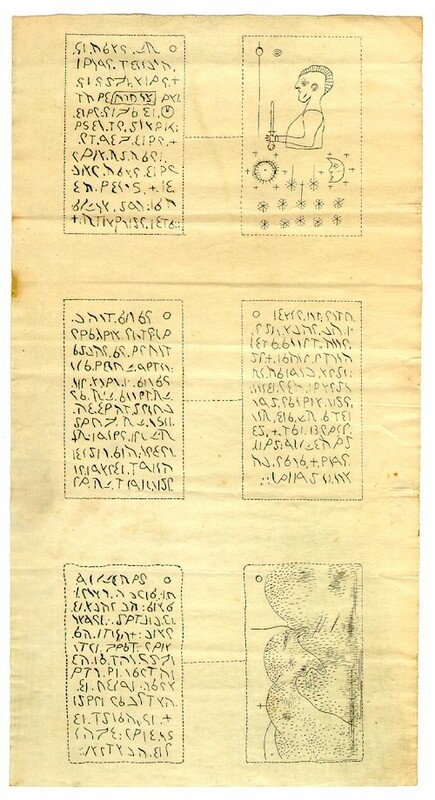 This earliest known imprint of the Mormons who followed James J. Strang is a rare facsimile of the brass plates, which in 1845 Strang purportedly discovered buried in a hillside beneath the roots of a giant oak tree at Voree, Wisconsin Territory, and which were lost at the beginning of this century. Later facsimile editions are less precise representations of the original brass plates, and in the absence of the plates themselves this early printed facsimile is the closest depiction possible of what was either Strang's cleverest scheme or his most sacred feat. The copy shown here belonged to Warren Post who was a resident of Voree, one of Strang's twelve apostles, and one of the seven witnesses to Strang's Book of the Law of the Lord. The complete provenance is through the Post family which retained the facsimile until it was acquired this year (1993) by John Jason Hajicek. This first edition is unlisted by either Dale L. Morgan or Chad J. Flake in their Mormon bibliographies. Morgan observed that Strang's publications are "sought after as are those of no other among the lesser Mormon churches; from their rarity and the singular circumstances of their publication, quite as much as for the content, they have excited historians and bibliographers." This now located facsimile is more significant than any of Strang's works except for the elusive Book of the Law of the Lord in the rare pamphlet edition. Milo M. Quaife, Strang's major biographer, recognized this and published the illustrative side of one plate as the cover of his book The Kingdom of Saint James. Strang's more recent biographer, Roger Van Noord, devotes an entire chapter to these sensational plates in his King of Beaver Island: The Life and Assassination of James Jesse Strang. Richard E. Bennett, in his Mormons at the Missouri, 1846-1852, observed (pp. 18-19) that Strang's success in Voree and at Nauvoo (of course driven by his publication of the Voree Plates), was Brigham Young's greatest threat forcing him and his followers out of the Midwest to Utahwhich demonstrates the importance of this present broadside. Behold I the Lord have spoken it. . . . I will give unto him the plates of the ancient records which are sealed up, and he shall translate them unto you; and this shall be a witness between me and those that serve me; and unto my servants who serve me faithfully, yea, unto whom I will, shall he show the plates, and they shall be faithful witnesses unto me, and thus shall my words be established. The Angel of the Lord came unto me, James, on the first day of September, in the year eighteen hundred and forty-five, and the light shined about him above the brightness of the sun, and he showed unto me the plates of the sealed record, and he gave into my hands the Urim and Thummim. And out of the light came the voice of the Lord saying . . . Go to the place which the Angel of the presence shall show thee, and there shalt thou dig for the record of my people in whose possession thou dwellest. Take with thee faithful witnesses . . . And while I was yet in the Spirit, the Angel of the Lord took me away to the hill in the east of Walworth, against White River in Voree, and there he showed unto me the record buried under an oak tree as large as the body of a large man; it was enclosed in an earthen casement, and buried in the ground as deep as to a man's waist; and I beheld it as a man can see a light stone in clear water, for I saw it by Urim and Thummim; and I returned the Urim and Thummim to the Angel of the Lord, and he departed out of sight. God revealed to me the place of ancient records and gave me the Urim and Thummim by the hands of an angel, whom I saw descend from and ascend to the heavens in open daylight, at midday, and from whose hands I took the Urim and Thummim, and both used it for seeing and for translating and returned it to him. On the thirteenth day of September, 1845, we, Aaron Smith, Jirah B. Wheelan, James M. Van Nostrand, and Edward Whitcomb, assembled at the call of James J. Strang, who is by us and many others approved as a Prophet and Seer of God. He proceeded to inform us that it had been revealed to him in a vision that an account of an ancient people was buried in a hill south of White River bridge, near the east line of Walworth County; and leading us to an oak tree about one foot in diameter, told us that we would find it enclosed in a case of rude earthen ware under that tree at the depth of about three feet; requested us to dig it up, and charged us to so examine the ground that we should know we were not imposed upon, and that it had not been buried there since the tree grew. The tree was surrounded by a sward of deeply rooted grass, such as is usually found in the openings, and upon the most critical examination we could not discover any indication that it had ever been cut through or disturbed. We then dug up the tree, and continued to dig to the depth of about three feet, where we found a case of slightly baked clay containing three plates of brass. On one side of one is a landscape view of the south end of Gardner's prairie and the range of hills where they were dug. On another is a man with a crown on his head and a scepter in his hand, above is an eye before an upright line, below the sun and moon surrounded with twelve stars, at the bottom are twelve large stars from three of which pillars arise, and closely interspersed with them are seventy very small stars. The other four sides are very closely covered with what appear to be alphabetic characters, but in a language of which we have no knowledge. The case was found imbedded in indurated clay so closely fitting it that it broke in taking out, and the earth below the soil was so hard as to be dug with difficulty even with a pickax. Over the case was found a flat stone about one foot wide each way and three inches thick, which appeared to have undergone the action of fire, and fell in pieces after a few minutes exposure to the air. The digging extended in the clay about eighteen inches, there being two kinds of earth of different color and appearance above it. We examined as we dug all the way with the utmost care, and we say, with utmost confidence, that no part of the earth through which we dug exhibited any sign or indication that it had been moved or disturbed at any time previous. The roots of the tree stuck down on every side very closely, extending below the case, and closely interwoven with roots from other trees. None of them had been broken or cut away. No clay is found in the country like that of which the case is made. In fine, we found an alphabetic and pictorial record, carefully cased up, buried deep in the earth, covered with a flat stone, with an oak tree one foot in diameter growing over it, with every evidence that the sense can give that it has lain there as long as that tree has been growing. Strang took no part in the digging, but kept entirely away from before the first blow was struck till after the plates were taken out of the case; and the sole inducement to our digging was our faith in his statement as a Prophet of the Lord that a record would thus and there be found. My people are no more. The mighty are fallen, and the young slain in battle. Their bones bleached on the plain by the noonday shadow. The houses are leveled to the dust, and in the moat are the walls. They shall be inhabited. I have in the burial served them, and their bones in the Death-shade, towards the sun's rising, are covered. They sleep with the mighty dead, and they rest with their fathers. They have fallen in transgression and are not, but the elect and faithful there shall dwell. The word hath revealed it. God hath sworn to give an inheritance to his people where transgressors perished. The word of God came to me while I mourned in the Death-shade, saying, I will avenge me on the destroyer. He shall be driven out. Other strangers shall inhabit thy land. I an ensign there will set up. The escaped of my people there shall dwell when the flock disown the Shepherd and build not on the Rock. The forerunner men shall kill, but a mighty prophet there shall dwell. I will be his strength, and he shall bring forth thy record. Record my words, and bury it in the Hill of Promise. It shall come to pass in the latter days, that my people shall hear my voice, and the truth shall speak from the earth, and my people shall hear, and shall come and build the Temple of the Lord. My prophet, unto whom I send my word, shall lead them, and guide them in the ways of peace and salvation. In Voree the name of the Mighty One shall be heard, and the nations shall obey my law, and hear the words of my servant, whom I shall raise up unto them in the latter days. These occurrences waked up the whole country to a high state of excitement, and several thousand persons came to examine the ground and the plates, and inquire after the occurrence. The whole country was filled with the fame of the occurrence, and numerous newspaper notices of the matter were given to the public. Early in the fall of 1845 (October), I went to Voree to investigate the claims of brother Strang to the First Presidency of the church. It was just after he had found the plates. He showed me the plates, his writings on the subject, Joseph's letter, and the revelations which he had received, and the translation that he had made of part of the record of Rajah Manchou of Vorito. C. Latham Sholes, who patented the first typewriter, viewed the plates and published his observations in the Southport Telegraph on 30 September 1845: "The plates were shown us, and we visited and examined the spot from which they purport to have been taken." Sholes was so bewildered by the circumstances that he announced that he could reach no conclusions. In his judgement Strang was "honest and earnest in all he said" and his witnesses were "among the most honest and intelligent in that neighborhood"altogether it was enough to "stagger" him, he wrote. Other descriptions of the plates were minute, as the account of one stranger who described the plates in the Gospel Herald, 23 September 1847, as "three small pieces of brass about 2 1/2 inches long by 1 1/4 inches wide, and about the thickness of a piece of tin, fastened together at one corner by a ring passing through them." Another visitor described them in the Gospel Herald, 26 October 1848: "The Voree plates, the wonder of many, I saw them and the place from whence they were taken. They are about one inch and a half by two and three-fourths, thickly covered with ancient characters of curious workmanship." Stephen Post, the brother of Warren Post, who as an outsider visited Strang so late as 3 July 1850, reveals that Strang still carried the plates everywhere he went. In retrospect of their visit together, Post wrote a detailed account now among his papers at the LDS Historical Department: "I told him I wished to see the plates if it was convenient, upon which he handed them to me from his pocket. The plates were three in number, small, about 1 1/2 inches by 2 1/2 inches; they were not polished very smooth before engraving, from appearance." The Voree Record is a genuine record as he said it was, and translated as he said it was . . . It is the opinion of this author that such similarities as these [analyzed] make a good case for the claims of James J. Strang . . . It is more likely that the translation was done literally, thus preserving the sentence structure and peculiar grammar of the language on the plates. The evidence is consistent with [Strang's] contention that the Plates represent a genuine text written in a language that is radically different from English; furthermore, that the translation furnished by James J. Strang is a superb (if poetic) rendition of that text into English. First, an eye. The symbol of God who is all-seeing: consequently it is called THE ALL-SEEING EYE, and has been used as symbolical of the DEITY in all countries, and in all ages of the world. Second, the figure of a man down to the waist, having a crown resembling a cap, and composed of radiating lines, on his head; and a scepter in his hand. These are symbols of authority, and show him a ruler. As he has the sun, moon, and stars (all the natural lights) below him and only the ALL-SEEING above him, he is Prophet, Seer, Revelator, Translator, and First President of the Church; governing not by natural light, or mere human wisdom, but by revelation, or the word of God, and derives his authority solely from God, and not in any sense from the actions of men. Third, the sun on the right, and the moon on the left. These represent the two Vice Presidents, or Counsellors in the First Presidency; the two largest natural lights being used as symbols, because they are to assist the First President in wisdom or natural light merely, and not by revelation. Fourth, a cross-pillar above and resting upon the center large star and under the human figure; two pillars above and resting upon the two upper large stars, and below and between the sun and moon. These represent Coadjutors, assistants or helps, of whom there have been several since the beginning of the Church, appointed by revelation. Fifth, twelve stars, six around the sun, and six around the moon. These represent the High Council of the Church. The division into classes of six each agrees with the established usages in the Church, one half to stand up for the accuser, and the other for the accused. This is not the High Council of a stake. Sixth, twelve large stars, ten of these in two rows at the bottom of the plate, and the other two over them nearly between the sun and moon. They represent the Twelve Apostles. These stars are larger than those which represent the High Council of the Church, because the Apostles have a more important ministry; but are placed below them because they are subject to their discipline, and below the symbols of the First Presidency because they are subject to its directions. Seventh, seventy small stars immediately within the points of the twelve large ones, being six to each, except the center one which has only four. They represent the Seventies, who are subject to the direction of the Twelve Apostles. Eighth, a straight line dropping down before the scepter. These symbols were all prophetic of the order that should exist in the fulness of times. Thus God, in his goodness to those who lived in days past, has shown them not only the rest which he had in reservation for them, but the perfectness of the means by which he would accomplish it. Probably now we understand it only in part, but in times to come we shall "know as we are known." Besides being one of the best sources to understand Strang's hierarchy, the above description is useful in determining the accuracy of the facsimile. Notice the description of the "seventy small stars" (or specks), which are supposed to be interspersed among twelve large stars (or asterisks), representing the Quorum of Twelve Apostles and Quorum of Seventy Elders in the Mormon Church. The center large star should have only four small stars between its six arms, otherwise there would be seventy-two (twelve times six) small stars. This distinction (besides details of fineness) differentiates between the 1845 printed facsimile and a later second edition made from Wingfield Watson's electrotype, which is flawed with seventy-two stars. Even before this broadside was found, the evidence was strong that such a facsimile was in fact printed in early Voree, and that the plates were afterwards shipped to Boston for publication in the Star in the East, a monthly periodical edited by Strang's right hand, George J. Adams. On 18 November 1846, H. L. Southworth, who was Adam's publisher, wrote to Strang in a letter also preserved among the Strang papers: "We have received from Thomas Braidwood the Fac Simile of the platesthe copper plate engraving, which we shall publish in the second number. . . . We receive a good deal of encouragement with regard to this matter, but no returns of any consequence." Morgan (p. 42) demonstrated that the second number of the Star in the East was issued in December, but no evident copy exists today. Since the copper plate engraving was sent by Strang to Boston, he would certainly have published a prior edition in Voree, but no copy ever surfaced. Finally, a copy of this early facsimile was discovered by Hajicek tipped into Watson's bound volume of Zion's Reveille preceding the 25 March 1847 issue, which by no surprise contains the translation of the platesa fact which aided in the recognition of this printed facsimile as an early Voree imprint. The copy shown here is identical to the copy first found by Hajicek, but comes from the collection of Warren Post, who died so early as 1875, leaving his intact collection securely shut a decade or more before Watson printed the second edition. I shall have to depend upon you to see that the type for facsimile of plates is accurate and true to the original. I do not know anything of the utility of the 'electro', but trust to your judgement as you must know greatly more than myself about it. Enclosed I send you $13.00. $11.00 for the wood cut, $1.00 for the electro & postage & requesting, and $1.00 for the printing of 1,000 facsimiles. Watson later loaned his electrotype plate to Henry E. Legler, who published it in his 1897 book A Moses of the Mormons: Strang's City of Refuge and Island Kingdom (p. 172). In January 1913 Watson sent the electrotype to a printer for Edward Couch, who published it in his pamphlet Teachings of Jesus (p. 19) in May 1913. Watson's woodcut was separated into three blocks with one third of the facsimile (or one brass record) on each block. It was divided among three of his granddaughters in the 1920s, and recently all three pieces were regathered by Hajicek from descendants. The earlier 1845 edition offered here is unmistakably different than those produced from Watson's woodcut or electrotype, however. It is ten percent smaller, it is printed on thinner and superior paper, it was drawn or cut with sharper lines and more precise workmanship, and it has the correct number of seventy stars. These distinctions make it valuable. This valuable broadside is the closest existing likeness of the three tiny brass plates purportedly found on the frontier in Wisconsin Territory. Besides being an excessively rare Western Americana broadside, this imprint and its adjunct testimony shook the society of Mormonism to its foundation, and was a force in Brigham Young's westward migration to Utah. As James J. Strang's first publication, as well as his most sensational, it is an essential part of any significant Mormon collection. faith toward God, and to repent of all sin. © Copyright 1996-2018 Church of Jesus Christ of Latter Day Saints. All Rights Reserved. The First Presidents of this Church were Joseph Smith Jr. 1830-1844, and James J. Strang 1844-1856. The First Presidency was at Voree, Wisconsin 1844-1850, and St. James (Beaver Island), Michigan 1850-1856. On this particular page, since January 1, 2004.